The Magician serves as a channel of higher forces to produce great transcendental changes in the history of people and nations. 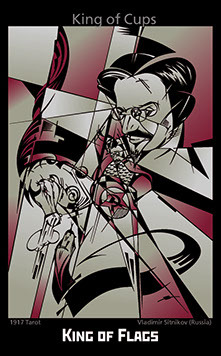 Magicians are driven by high energies, which they refer to as “passion,” and they feel a call that cannot be ignored. The results of their actions can be great or doubtful, but the higher forces put these people in a certain place and time to “do magic.” The author saw in Vladimir Lenin a Magician, who knew how to interpret the voice of the people and so made the people follow him. Keywords: purpose, ability and will sent from above. Depicted as the High Priestess is the last Russian empress Alexandra Fiodorovna Romanova. Hers was a very ambiguous figure of Russian history. Many mysteries and secrets are connected with Alexandra Fiodorovna. On the one hand, she had fascination for mysticism, and on the other hand, she was very religious. Some researchers consider her responsible for the tragic fate of Russian imperial house. Photos and artistic portraits of the empress preserved to this day always show sad, sorrowful eyes of this woman. That’s exactly how the High Priestess looks at us. It seems that, like the Priestess, Alexandra Fiodorovna knew what terrible trials would befall her family. The bloodstained crescent and skull represent the upcoming bloody revolution and murdering of the Tsar family. 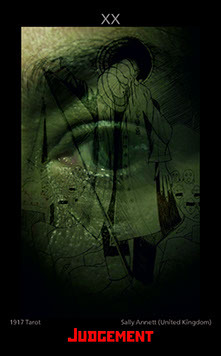 Keywords: secret knowledge, possession of information inaccessible to others, knowing of the predetermination of events. Here we see the Empress of the new era. This is a woman who, as the famous Russian poet put it, “will stop a horse galloping, will enter a burning hut.” Much the same way will she drive a tractor, and plow up a field, and gather the harvest, and save what’s been earned. One of the principles of this new Empress is that we don’t expect mercy from nature, we extract resources by ourselves, we get man-made energy sources. 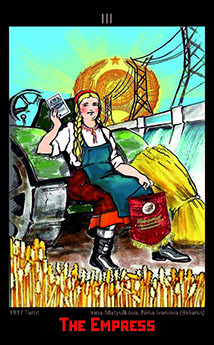 The new idol of time is a “shock-worker of socialist labor.” Such a shock-worker lady is in fact depicted on the card. Softness and femininity are gone with the advent of the revolution. Despite this, she is still beautiful, generous and loving, and ever ready to create a new world inspired by the ideals of the revolution. Keywords: abundance, excellent health, diligence, accumulation and preservation, building and creation, including creation of the main Soviet unit of society, the family. 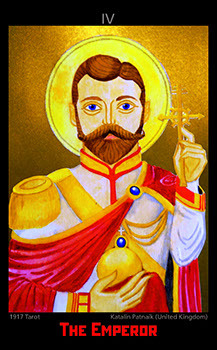 The card shows the icon of Nicholas II, the last tsar of Russia. 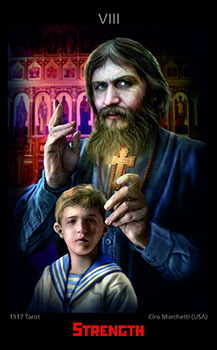 He and his family have been canonized by Russian Orthodox Church as “Royal passion bearers” in 2000. This fact shows that even after so many years of Soviet rule many Russians still hold on to the sentiment of the Tsar being their father and protector of the land. Many believe Nicholas II did his best in the difficult political situation, although historians state he was a weak ruler detached from his subjects. Be as it may, Nicholas II underestimated Lenin’s importance, unknowingly giving way for the 1917 Revolution and the foundation of the Soviet Union. The card reminds us to “rule” with justice and compassion, be it within our families or at work. One should aspire to be just and honorable and do what is right, even in the face of opposition, – and to never underestimate one’s enemies. Keywords: a strong male figure, father, manager, celebrity; discipline, ethics and principles; routine. 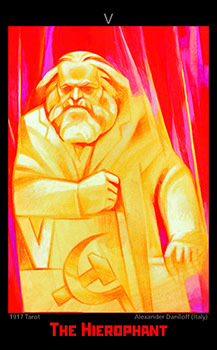 The ideologist of Communism Karl Marx, almost deified in Soviet Russia, is depicted on this card as a shining gilded colossus that makes us recall a parody of the USSR national anthem passed from mouth to mouth: “We do not need the sun as the party shines for us!” The card offers an ironic look at the pomposity of Soviet propaganda posters as a part of Communist environment. Keywords: an ideologist, founding father of a teaching; indirect participation in events passing under the banner with the image of this person. This is the card of Choice. 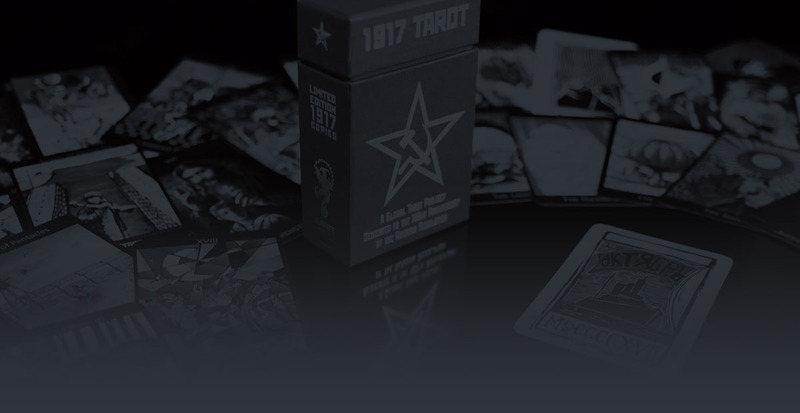 In this deck the Lovers Arcanum reflects the choice of the whole country, committed during the revolution of 1917, the choice of rejection of old social and spiritual values. 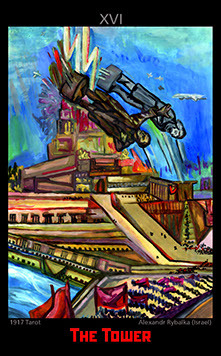 On this card there cannot be an Angel, because the ideology of materialism has been proclaimed the main principle of life. From the trinity of mind, soul and spirit, the spirit is excluded as something ephemeral and unreal. A broken bell and trampled icons and banners are symbols of uprooting of the old values. It has been decided not to heal what was painful but to remove it altogether. 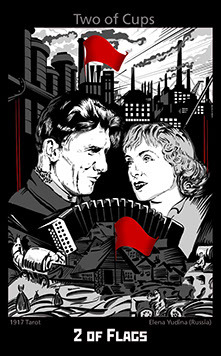 A man and a woman take tools (sickle and hammer) into their own hands and try to build their own brave new world. Keywords: a conscious, though possibly wrong choice; emotional uplift. Keywords: new ideas, inspiration, powerful movement, confidence, irreversibility of action; self-control or control of the environment; the victories that are possible through willpower and self-mastery. 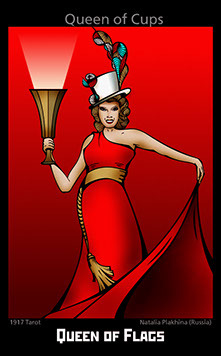 If related to an event, the card indicates a most fortunate outcome. 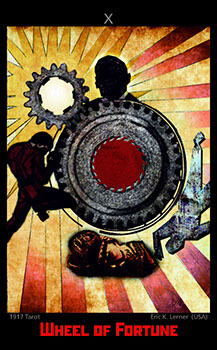 The Strength card in the context of 1917 Tarot is interpreted as fortitude rather than physical force. This is traditionally symbolized in Tarot by the juxtaposition that depicts a smaller female figure controlling a physically stronger lion. The same symbolism can be attributed to Rasputin, whose source of power can be perceived in a similar context, be it an actual gift of some spiritual nature or simply the desperate wishes of the Tsarina, a mother wanting to believe that he mighty elder indeed had the power to cure her son. Either way the circumstances provided an historic, albeit temporary, opportunity that through the strength of his persona and will Rasputin was able to manipulate people and wield great influence and power. Keywords: influence, authority, subordinating people through one’s own spiritual power. 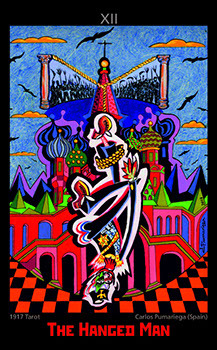 The Spirit of Tsar Nicholas II is returned to the Winter Palace – now calm and no longer in fear and pain, he is lamenting on the development of his native land, on how the revolution and the war itself changed people into stronger men and women after long-long journeys of pain, sorrow, poverty, losses – but also love and hope during probably the toughest and most difficult years of Russia. Nicholas is alone – with his beloved ones in his heart. 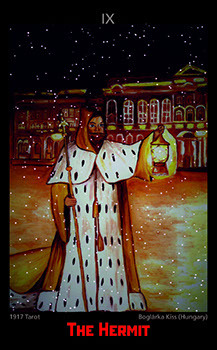 His Tsar costume fits the elegance of the Winter Palace in the winter night lights. Despite the sadness and the tragedy of the Romanov family and Russian people from that era, the card suggest peace, love and hope. Keywords: turning inwards, sorrow, isolation, faith, love, hope, inner strength, inner journey, development, seeking God. 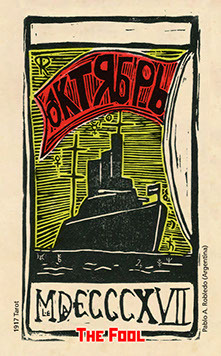 The Wheel of Fortune in Tarot 1917 was inspired by two quotes: “He who was nothing will become everything!” (from the Russian version of “The Internationale”), and “Where there is a person there is a problem, no person no problem” (attributed to Stalin). This card has traditionally indicated a sudden change of fortunes. 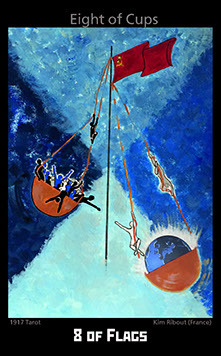 In Tarot 1917 the Bolshevik is ascendant on the Wheel while the royalist falls off the wheel. The image of royalty embodied by the fallen bust of Tsar lies broken at the bottom. But who ends up on top? Is it the everyman, a dictator, scientist or prophet? It may still be too early in time to fully grasp who really won in the Russian Revolution. For a reader, the card suggests that no position on the wheel is stable. Change is in the air. The surrounding cards will indicate what direction that shift might take. The Wheel merits great attention because the scope of its force and manifestation may be ground-breaking. 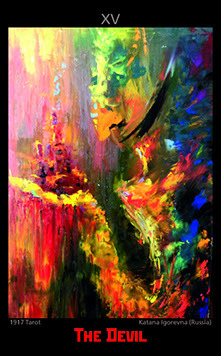 Keywords: instability, dizziness from success; innovation the benefit of which time will show; the manifestation of strength, internal or external. Justice is subjective. 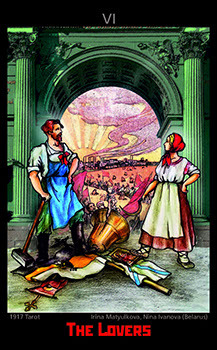 This card shows the majority’s agreement with the fairness of one. The author tried to convey the power of the human thought, to show how forceful it can be in the right hands. Keywords: subjectivity; the call to pay attention to the one in whose hands are the power and authority; always evaluate the personality traits of those from whom the idea of justice comes. Black birds, night, open sky, against which two columns rise. From their capitals stretched are two ropes. A terrible event unfolds, revolt of the rebellious masses, which ends with the hanging of Tsar Nicholas II on the Red Square. Thus begins the October Revolution of the year 1917. The card is an allegory, therefore the geographical and chronological sequence of events is not important here. The central theme of the card is the death of Tsar Nicholas II. Keywords: the madness of the masses as opposed to the humility of the renunciant tsar, the absorption of the interests of individuals by the abyss of the will of the masses. 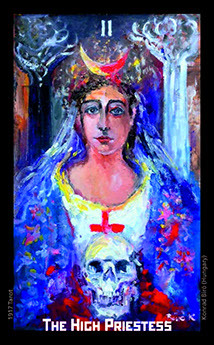 The Arcanum XIII, the only unnamed Arcanum of the traditional Tarot! Here nothing survives the blind violence! The red terror confronts another terror that might be called white terror. The half-skinned white rider carries an anachronistic submachine gun to show the timelessness of the violence. This white rider is also a nod to the White Walkers (The Others) in the “Games of Thrones” series. Keywords: transformation, cleaning; rebirth, new structures. 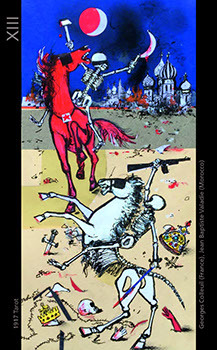 The Moderation card refers us primarily to the passage of time, the flow of one era to another, and raises the question of why the Russian reality remains virtually unchanged on a deeper level? Russian writer Saltykov-Shchedrin is credited with saying: “If I fall asleep and wake up in a hundred years, and they will ask me what is happening in Russia now, I will answer: drinking and stealing.” Alcohol in Russia is more than a chemical formula. It is the foundation of many folk spiritual traditions. Alcohol in itself is neutral, like this card. It is only a pass to one’s inner “I”, a symbol of the spirit that is hidden in matter. Keywords: Slow time. The right measure. Grace. Liquid. Many a Bolshevik leader were called Devils by the counter revolutionary propaganda: Lenin, Trotsky, Sverdlov... But the Devil would be too simple if its image were that clear. Who is hiding behind this smirk? Whose bloodstained heart beats in this hand? Or is it the bend of some well-known smoking pipe? Propaganda in the spirit of “Power to the people,” belief in slogans such as “The land to the peasants, factory to the workers,” the elusive grin of those who manipulated the masses with the help of those simple tools... If you want to see the Devil, look inside yourself. Keywords: manipulation, ridicule; the desired goals and hopes are in the fog (more precisely, in the pipe tobacco smoke). 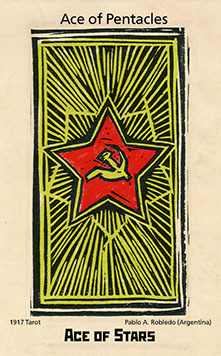 The Tower card depicts two lightnings (or Sieg runes meaning “victory”) throwing Marx and Lenin off the tower of the never built Palace of Soviets. 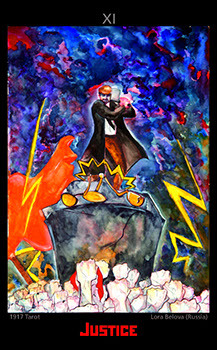 The card speaks of the danger of illusions, especially of social ones. The other message is that a totalitarian ideology always gives rise to another one, even more cruel. That a totalitarian way of action can lead the people to happiness is the illusion of the Tower of Babel, whose builders wanted the same. Keywords: confusion; warning of the danger of illusions. In the evening of November, 7 (October, 25 by the old Russian calendar style), 1917, the famous idle salvo of the cruiser “Aurora” gives a signal to storm the Winter Palace. Against this backdrop, Aurora, the goddess of the morning dawn, weeps over the stars floating in the blood, which symbolize the armies fighting during the revolution. Keywords: hope and faith in one’s own rightness and happy destiny that will not let one perish. Keywords: unpredictable events that are difficult to understand, an unexpected rebellion, a temporary victory or confidence in victory. 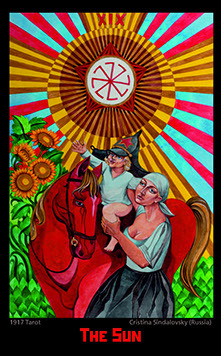 This card shows the Proletarian Sun and a red horse as a symbol of the new life and strength of the Bolshevik Party. 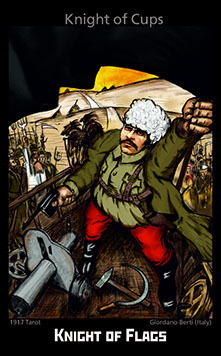 The boy Kibalchish in his father’s budyonovka (broadcloth military helmet), the character of Arkady Gaidar’s fairy tale, is still too young to fight the bourgeois. He is happy and joyfully laughing while opening himself to the new world. Instead of the traditional stone wall the card features his mother’s arms, a symbol of support and protection. Like the God’s Mother, she can predict the sacrificial future of her son and many sons of the Russian land. Ahead is a civil war. The sun is at its zenith and will soon move to the sunset. The Mother is the image of Russia. 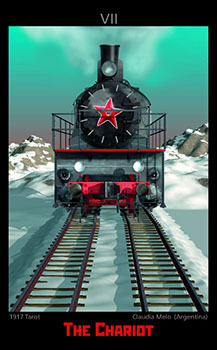 In the center of the red revolutionary star we can see the Kolovrat, a solar Slavic symbol for connection of generations, change of the seasons and of epochs. Four classical sunflowers are too solar symbols for well-being, harvest and the result of peasant’s labor. Keywords: communication of generations, help, protection, anticipation of the change of epochs. 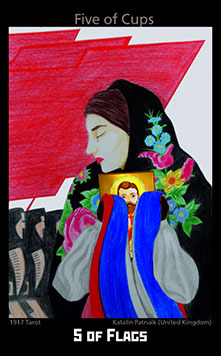 This card deals with the power of hindsight, with the influence and understanding of political and media power seen through the distance of time allowing a more objective and transpersonal understanding of the cycles and patterns of history. The eye of the individual can only vaguely perceive parts of the overall picture. The layered commixture of photographic and hand drawn images hint at differing realities, the concrete illusions that we create internally and that may bear no relation to immediate collective truths. Keywords: time necessary for discerning reality from illusion and for assessing what happened. 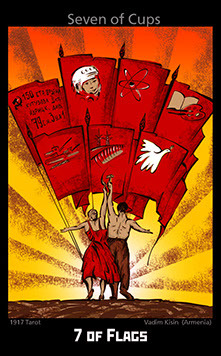 The World card contains symbols of the Revolution: the hammer and the sickle. During the Russian Revolution, the two tools were the metaphor of communion between the working class and the industrial men. 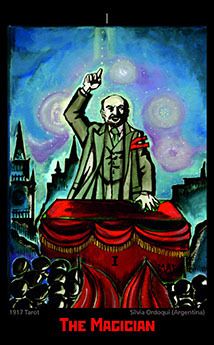 The World itself is shown on the card as a globe painted red, the color of blood and revolution. In 1917, the Romanov dynasty in Russia fell and a new communist world was born, inspired by the ideas of Karl Marx. The Russian revolution arose in an autocratic and archaic country in need of constitutional reforms and universal suffrage. The Russian people had the strength and courage to change their destiny and the destiny of an entire nation. Keywords: desire to change destiny for the better. In the sky above the cruiser Aurora, the planets are symbolically depicted in the position they occupied at that historic moment when Vladimir Ilyich Lenin ascended to the rostrum to deliver a speech depicting the foundations of the future Soviet Russia. 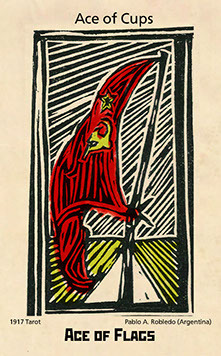 Following the Marseilles Tarot system, the artist intentionally left the top margin of the card blank, without indicating the number of the Arcanum. In the lower margin, where the card title is usually indicated, the author placed the French word Le Mat (“Fool”), disguised among the inscription denoting 1917 in Roman numerals: MDCCCCXVII. Keywords: Fatal event, resulting in colossal changes. A fool, acting as a headsman, cuts the crown with his ax. Blood spurting out of the crown will soon flood the whole of Russia. 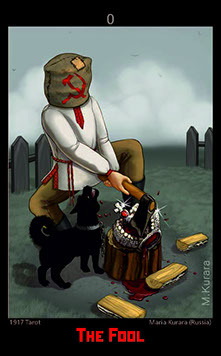 The fool’s head is covered with a sack symbolizing ignorance and misunderstanding of the consequences of his actions. The fool acts blindly or instructed from outside and commits a fatal blow to himself and to the whole world. A dog signifying the mind, a faithful friend, barks nearby, loudly warning of the stupidity of this act, but the fool ignores it. Keywords: imprudent action that can lead to disastrous consequences; inability to calculate the results of one’s deeds. Suits: Flags (Cups): ideology, Communist Party, Soviet intellectuals. This card depicts a red flag attached to a bayonet, calling to go into battle and give up life for the victory of the communist ideals. The red color of the revolutionary flag has been explained by the Communists as embodiment of the blood of the oppressed classes shed in the struggle for liberation from exploitation. According to the Marseilles Tarot tradition (where Coins are instead of Flags), the sign of this suit is not held in hand. Keywords: emotional recovery, solution of problems, unity, ecstasy of victory, including internal or personal victory. This is a card of cooperation, unity and new perspectives. It symbolizes the alliance of workers and peasants, or, in the Soviet parlance,“linking the city and the countryside.” Against the backdrop of industrial giants and endless fields we see a lyrical meeting of a male worker and female farmer. This is a scene from the popular Soviet film “The Tractor Drivers,” starring Marina Latynina and Nikolai Kryuchkov, prominent Soviet actors and icons of the era. Keywords: establishment of promising relations, successful cooperation, mutual sympathy. 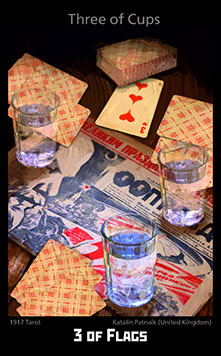 On an October Revolution anniversary day a typical Soviet family gathers in the kitchen playing simple card games and drinking vodka. This picture is inspired by the author’s nostalgia for the time long gone, when she, as a child, spent hours with her grandparents playing Rummy. Keywords: happiness, fun times, parties, fun with friends, a holiday. A young woman is just coming in from farm-work. 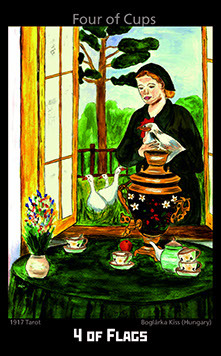 Looking a bit melancholic, wondering if life will ever offer her better options – like the family whose samovar and elegant cups are visible on the table. She is safe and sound, knowing life can be very tough, but it depends on us if we accept the good things it offers besides all our daily struggles. What life offers her right now is not bad, but could be better, indeed. Sometimes we just need to recognize the importance of the first steps towards our dreams. Gloominess and the first steps are also parts of the bigger puzzle. Keywords: gloominess, acceptance, the necessity of finding joy in everyday tasks, even in monotony; accept what life offers you right now; insecurity and sadness vs. optimism and joy. A woman holds two flags near her heart: one the old flag of Russia before the Revolution, one the flag of the Russian Orthodox Church. She cries for the olden days and doesn’t want to see the marching soldiers of the Socialism declaring the greatness of the nation. The icon in part covered by the flags portrays the overthroned Tsar, Nicholas II. Keywords: loss, grief, crying over spilled milk; the inability to move forward. After the World War and October Revolution of 1917 homelessness in Russia took on a menacing character. By 1922 there were about 7 million street-living children in Russia. Solution to the problem of homelessness was declared a political task. Who are the children depicted on this card to each other? Are they siblings who lost their parents? They are sitting right on the pavement, amidst the devastation. Their faces are lively, expressing confidence and joy of simple daily affairs. Behind them we see the figure of a future emigrant who is hurrying away from the past life and is late for the leaving steamboat. In the sky the Red Army soldiers are blazing in the dawn of the revolution, symbolizing the inevitable changes and movement of the new life. What awaits the homeless children? We do not know. Perhaps they will perish in the revolution flames, but they have chances for a better future. Keywords: little happiness, new opportunities, children, a promise for the future. 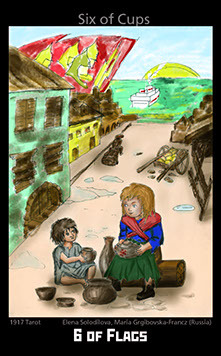 On this card we see a young boy and girl holding hands. Their poses convey a feeling of joyful anticipation. 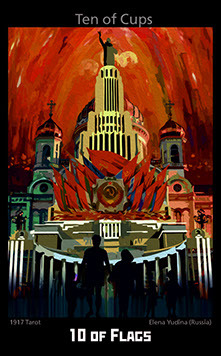 In front of them, against the background of the rays of the rising sun, seven banners flutter with symbols of hopes, future achievements and victories of the Soviet government: collectivization, industrialization, world peace, universal literacy, victory over fascism, scientific and technological revolution and space exploration. Keywords: unexpected help and support (if you are moving towards a real goal); favorable time for the creative process. 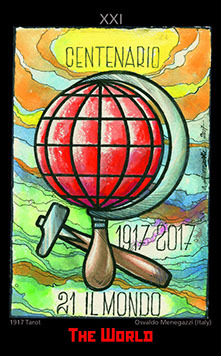 This card symbolizes the “Khrushchev Thaw,” which refers to the period from the early 1950s through the early 1960s when repression and censorship in the Soviet Union were relaxed and millions of Soviet political prisoners were released from GULAG labor camps due to Nikita Khrushchev’s policies of de-Stalinization and peaceful coexistence with other nations. The scales recall the Major Arcanum number 8. The nation liberates itself. The world seeks its equilibrium. Keywords: a transition period, during which, while hoping for the long-awaited freedom and happiness, there is a danger of facing dreary nostalgia and a painful break with the former state of things. This is our victory! Truly ours. Because we knew how to fight, stand to the death, wait, endure, remember, yearn, overcome. There is no more danger, the sun is shining through the red banners in our hands. Everyone has walked his own way, and we are all one. The victory has been won. And this is not a gift or good luck, sent down by the gods; there were battles and thoughtful tactics. You can watch the captured frontiers and be calm: the enemy is no more. 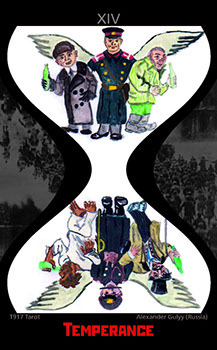 Keywords: a success won, a victory deserved, a holiday; Victory Day. 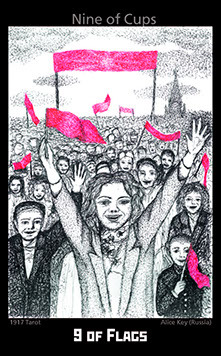 This card is dedicated to Inessa Armand, an activist of the Russian revolutionary movement, a confidant and, in the opinion of some historians, a mistress of Vladimir Lenin. 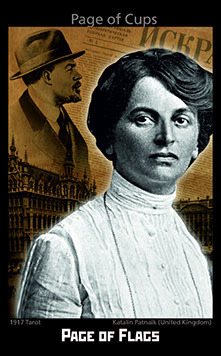 She fell in love with Lenin’s articles and books, and their first meeting in person according to some sources was held in Brussels, and we see an old picture of the Royal Square as the card’s background. This meeting has changed her life completely. Keywords: birth of new feelings and emotions; advent of an idea; momentum, push, chance. Nestor Makhno was a prominent anarcho-communist figure, one of the organizers and leaders of the revolutionary movement in the south of Ukraine during the Civil War. 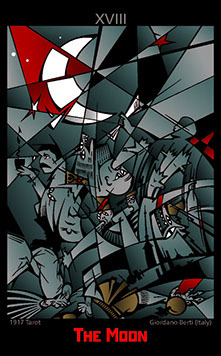 On this card Makhno is depicted with the flag of anarchists and surrounded by a crowd of poorly-clad but armed peasants. Keywords: ability to inspire and enthrall people, strong imaginative thinking, manifesting of what seems impossible. On the card her gown is made of a red banner. This is a bright, sensual, brilliant female image of the Soviet era in the period of its formation. Outwardly she was wide open, talkative, seducing, but in real life beyond the stage she wouldn’t allow anyone into her private world. Orlova was one of the first Soviet women who resorted to plastic surgery, which can serve as an additional touch to her image — or perhaps her mask. Keywords: a person with power and influence over the minds; a mask, preventing from discerning the true essence. Keywords: calm appearance and emotional character, strong personality. Suits: Hammer and sickle (Wands): workers, kolkhoz (collective farm) peasants. A hammer and sickle, the symbol of the unity of workers and peasants, is the main state emblem of the Soviet Union and one of the main symbols of the Communist movement. The card depicts the symbol as held in the left hand in accordance with the Marseilles Tarot tradition. Keywords: state power, opening opportunities, moral principles, great potential.